I’ve been at it again on the grill this week. I can easily get into a rut with grilled chicken, pork, steak, and fish so in an effort to create some variety in our diet, I’ve created Mediterranean flavored lamb kabobs. I always associate rosemary with Mediterranean dishes and it’s a perfect compliment to lamb. We have several big festivals during the year in Atlanta and I have to admit one of the things I like best about these festivals is the carnival food. The food trucks offer pizza, funnel cakes, sausages and peppers, cotton candy, and corndogs. I always gravitate toward the gyro truck, where I enjoy a very messy but delicious shaved lamb sandwich on pita bread with tzatziki sauce, lettuce, and tomato. Tzatziki is a cucumber and yogurt sauce and serves as the perfect cooling balance for the lamb. 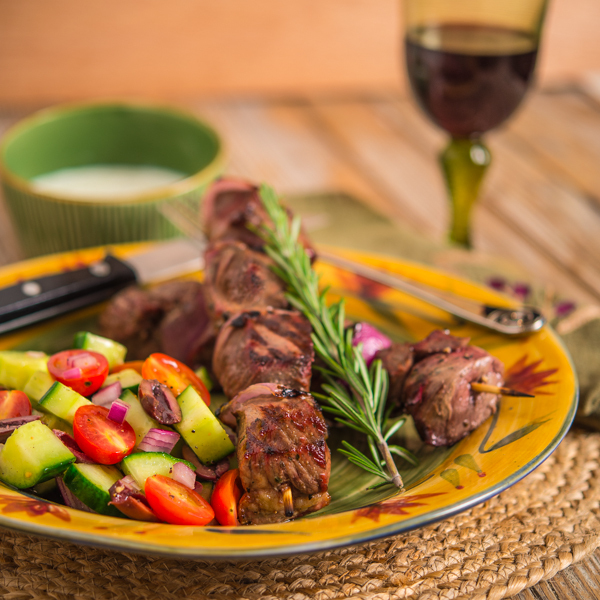 For this post I’ve paired the lamb kabobs with a simple and delicious cucumber and tomato salad. Serve this great summer meal with a full-bodied red wine and delight your friends and family. 1. Squeeze liquid from grated cucumber. 2. Mix all ingredients well and refrigerate for 1 hour. 1. In a medium bowl, combine cucumber, tomatoes, olives, and onion. 2. Whisk together vinegar, olive oil, salt, and pepper. Pour over vegetables and mix well. 4. Before serving, add parsley and mix well. 1. Whisk together lemon juice, salt, black pepper, mustard, rosemary, and olive oil. In a large bowl, toss lamb with marinade making sure lamb is completely coated. Cover and refrigerate for 2-3 hours. 2. Soak wooden skewers in water for 30 minutes. 3. Remove lamb from marinade and alternate 4 cubes of lamb and onion on wooden skewers. 4. Heat grill or grill pan to medium high heat. Place skewers on grill and cook 3-4 minutes on each side. Use a meat thermometer to cook to preferred doneness. 5. Serve immediately with tzatziki sauce and cucumber salad. This sounds fantastic! I’m running to the store tonight to pick up some lamb. We’re definitely into the grilling season here as well. I’ve never done lamb kabobs but I think you just have changed that. We love lamb and this is a great way to enjoy it. Lovely kabobs and great looking salad! I don’t think I love anything more than lamb for some odd reason. These kabobs look so flavorful! Lamb and rosemary is such a wonderful combination. I miss my giant rosemary bush I had at my old house. Your kabobs look amazing.